Pet Beds for Your Best Friend! 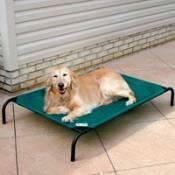 Your pet will love this Coolaroo Dog Bed which is raised about 7 inches off the ground or floor. This material is resistant to flea and insect infestation as well as to mold and mildew and comes with a Limited 5-year warranty which makes it a terrific dog bed. 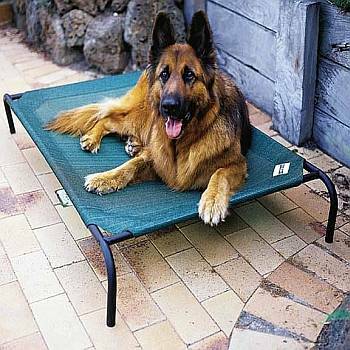 These beds are great for older dogs with arthritis as the hammock style prevents hard pressure points on your dog's joints. Coolaroo's all-weather knitted fabric creates a superior dog cot due to breathable material which allows the flow of cooler air underneath the bed mat to help keep your pet cool during the hot summer months. 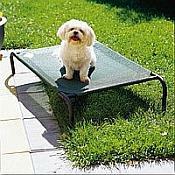 This elevated pet cot is very easy to maintain. You simply brush away the pet hair and other debris and then spray the pet bed with a water hose and allow it to air dry. 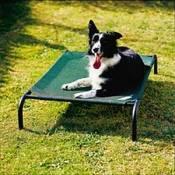 You don't have to worry about the bed wearing out, you can also order Replacement Covers for your dog bed. So, your pet can enjoy this fine Coolaroo Dog Bed for years to come. This is a terrific product to show your special "member of the family" just how much you care! All the Coolaroo beds come with a frame made of black, powder coated steel. The material is imported from Australia. Replacement Covers for this dog bed are available in a variety of pet bed colors. Both the Dog beds and their replacement covers come with a Limited 5-year warranty manufacturer's warranty.